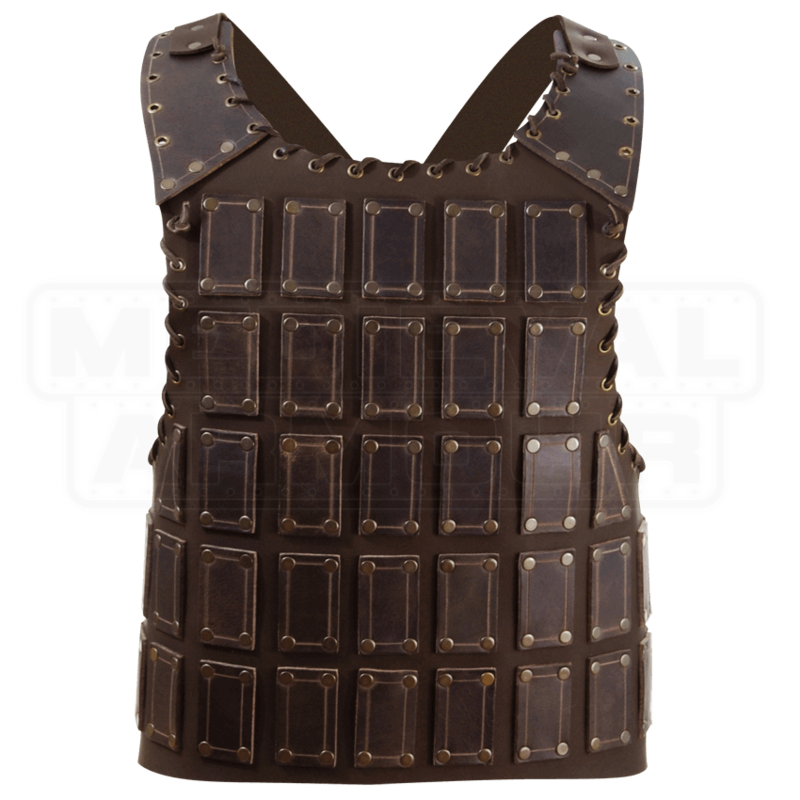 Inspired by the medieval coat of plates armor, this Bohemond Leather Breastplate offers a superior level of protection at a minor weight, allowing this armor to be worn easily and comfortably, whether you are at the fair or marching into battle. This armor is made from two different weights of leather, although this variation does little to hinder its protective ability. This is because the base layer, which is 3-4 oz. buffalo leather, is adorned with several close-set square plates of rigid 9-10 oz. buffalo leather, creating a solid and sturdy design that provides plenty of protection with ease, without forcing the wearer to sacrifice anything in terms of speed or agility! Each plate is individually riveted onto the base layer, and the shoulders are further reinforced for added strength and durability. Laced leather accents adorn the neck and flanks of the armor. 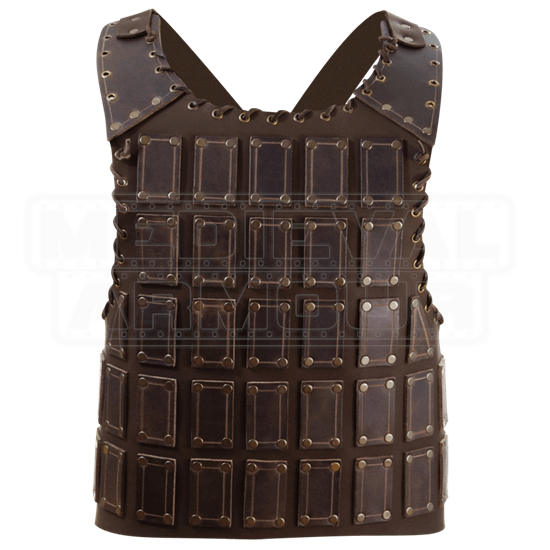 Attached to the shoulder straps are several open grommets, which allow the armor to be customized or enhanced with the addition of pauldrons or other personal accents and protections. It is available in four sizes and each size features a quartet of leather straps with buckle closures for wearing. One strap each goes over each shoulder and crisscrosses over the back, while the last two secure around the back. Because it fits more around the waist than the chest, the armor is sized according to the waist, as opposed to the chest. There is an almost dwarven sort of style to this armor, and that makes it a solid choice for fantasy settings. All in all, though, this Bohemond Leather Breastplate is nothing if not versatile, allowing you to wear it how you want and when you want. And with how protective is and how great it looks, you would be well-served to wear it quite often, indeed.